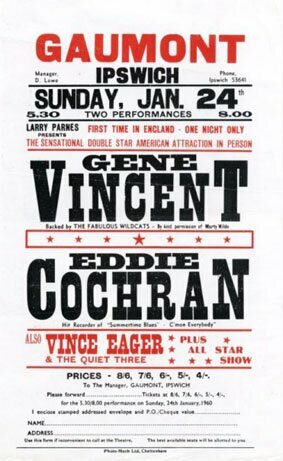 The famous and ill fated tour of American Rock 'n' Roll Stars, Gene Vincent and Eddie Cochran in 1960 organised by British music impresario, Larry Parnes . In 1956, the impresario Larry Parnes had catapulted Tommy Steele to stardom as Britain's answer to Elvis Presley. Tommy Steele played along for a while, but he was not threatening enough to be an Elvis Presley and his records made with London jazzmen lacked Presley's commitment. As Tommy Steele developed into a family entertainer, Larry Parnes tried again with Marty Wilde and Billy Fury, who were more committed to the new music. The managers of the American rock'n'roll stars had been reluctant to send their charges to the UK as there was more money to be made in the US. Bill Haley had passed his peak when he visited in 1957; and although Buddy Holly toured with success in March 1958, the rest of the bill was end-of-the pier variety. Lew and Leslie Grade promoted Bill Haley and Buddy Holly but they came unstuck in May 1958 when a Jerry Lee Lewis tour was cancelled after he revealed the age of his wife. There never was a sweet Gene Vincent. In 1956, when he was 21, the curly-haired boy from Norfolk, Virginia had stormed to success with "Be-Bop-A-Lula", but his unpredictable behaviour alienated him from his band, the Blue Caps, who complained to the union. By the autumn of 1959, he was banned from many States and reduced to playing small-time dance halls with pick-up bands. His new manager, Norm Riley, thought European dates were the answer as nobody would know of his problems. The TV producer, Jack Good booked him for ITV's Boy Meets Girl and arranged a guest appearance at Tooting Granada on Marty Wilde's stage show. Gene was super-polite, saying "sir" and "ma'am" to everyone, and performed very well. Larry Parnes set up some tour dates with Wee Willie Harris in January, while Jack Good worked on his image. He loathed Vincent's vivid green suit with "GV" on the pocket, but loved the intense way he would gaze into the distance while he sang his songs. "Gene wore a leg iron," he recalls, "so he hobbled a bit. I was a Shakespeare fan, so hobbling to me meant Richard III. I even thought of giving him a hunchback, and I'm glad I didn't! Then I thought, 'He can also be moody like Hamlet', so we'll dress him in black from head to toe and put a medallion round his neck." Norman Riley suggested another artist to Good and Parnes: Eddie Cochran. Cochran was a great-looking 21-year-old musician, who had grasped the techniques of over-dubbing, often playing several instruments on his records. His wittily observed commentaries on teenage life, "Summertime Blues" and "C'mon Everybody", matched Chuck Berry's, but following Buddy Holly's death in a plane crash in February 1959, he had been reluctant to tour. Riley told him that once he got to the UK on a major airline, there would be no flying. Indeed, most of the tour was by train and there is a telling photograph of Brian Bennett, later with the Shadows, struggling with his drum-cases on Bexhill Station as shown below. Brian Bennett - Drummer with Marty Wild's Wildcats (prior to joining the Shadows) at Bexhill-on-Sea Railway Station, Sussex in 1960 struggles with his set of Drums along the Platform. Larry Parnes set up a tour, mostly two houses a night, from January 24 to April 16, 1960 a combination of complete weeks in the big cities and one-night stands elsewhere. 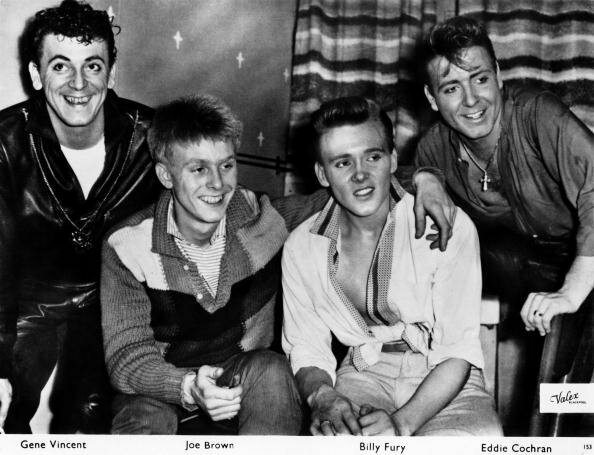 He completed the bill with his own artists, Billy Fury, Joe Brown, Vince Eager and Tony Sheridan, as and when they were available, and he secured valuable TV and radio publicity via further appearances on ITV's 'Boy Meets Girl' and the BBC Light Programme's Saturday Club. This was the first 100 per cent rock'n'roll package to tour the UK and advance ticket sales were good. Gypsy Lee, Fortune Teller with Eddie Cochran at Blackpool, Lancashire in 1960. Marty Wilde met Eddie Cochran when he arrived on mid-January: "The first thing I noticed about Eddie was his complexion. We British lads had acne, and Eddie walked in with the most beautiful hair and the most beautiful skin - his skin was a light brown, a beautiful colour with all that California sunshine, and I thought, 'You lucky devil.'" Eddie Cochran and Gene Vincent would be backed by young British rock'n'roll musicians, among them, 16-year-old Georgie Fame: "We were told to report to this club in Soho to meet them. I remember Eddie playing guitar and we were astounded. Apart from his own stuff, he could do all that brilliant finger-style stuff that Chet Atkins did. Then he played this amazing intro to "What'd I Say" and apart from a few blues enthusiasts who had the Ray Charles record, nobody had heard it before. He played "What'd I Say" every night and within six months, every band in the country was playing it." In a couple of days, Cochran had turned the British youngsters into a viable rock'n'roll band. "Eddie had a great trick," says Joe Brown. "He put a second string instead of a third string on his guitar, so that he could bend it and get those bluesy sounds that you never heard in England. I nicked the idea and got lots of session work as a result." The tour began at the Gaumont, Ipswich. Eddie Cochran said: "It's great to be hear in Hipswich", and then gyrated his hips, thus milking the screams. Cochran was an instant success but Vincent proved to be variable. All his songs opened with "Wel-l-l-l-l" and it was touch and go as to whether the band would pick up what was next. "Gene liked me to crouch down so that he could swing his bad leg over my head," says Joe Brown. "He was very accident prone and at one stage he was in plaster up to his thigh. He swung his leg up in the usual way, but caught me on the side of the head. It knocked me flat and squashed my guitar." As they toured the country, the reviews were appalling. The Yorkshire Post described the tour as "a prolonged assault on the eardrums". The Leicester Mercury said: "These 'singers' seemed to get enjoyment out of leg-kicking, face-pulling and making the youngsters scream. I cannot believe this is true entertainment. Why do these idiotic teenagers behave in such a ridiculous fashion? " Eddie Cochran, who, prior to the tour, had only known Gene Vincent casually, realised what a liability he was, a paranoid fantasist who needed looking after. However, they were strangers in a strange land, not used to cities that shut down at 10.30pm, no daytime or late-night TV and no American comics. The young British musicians were drinking occasional pints of bitter and they were surprised to find Cochran and Vincent constantly slugging Jack Daniel's from the bottle. They were wary of Vincent who, if antagonised, would say, "Wanna meet Henry?" and pull out his switchblade. One night, he cut up the road manager's suit... while it was still being worn. The guitarist Big Jim Sullivan remembers, "Eddie was so drunk at the Liverpool Empire that we weren't sure that he would make it to the stage. It had one of those microphones that came up from the floor. We positioned Eddie so that it would come up between his body and his guitar and he could balance on it." One thing that kept Eddie Cochran happy was a succession of girlfriends. After melancholy phone calls to a Hollywood girlfriend, the songwriter Sharon Sheeley, he was surprised when she came to England and joined the tour party. Larry Parnes was very happy with the receipts and persuaded Cochran to join Vincent for a further tour in late April. The final week of the first leg was at the Bristol Hippodrome. This would become Eddie Cochran's final appearance. After the final show at the Bristol Hippodrome, on Saturday, April 16th, 1960 Gene Vincent (25), Eddie Cochran (20) and his girlfriend, Sharon Sheeley (20) and agent, Partick Tompkins (29) of Camberwell, South London decided to go to London in an unlicensed cab, a Ford Consul MKII driven by a George Martin from Hartcliffe, Bristol. They were all due to fly out back to Los Angeles the following day, Sunday lunchtime from London Airport. They were interestingly due to meet 19 year old British Rock 'n' Roller Vince Eager who was due to accompany them to the States. As the Consul MkII sped outside Chippenham in Wiltshire both Eddie Cochran and Sharon Sheeley were afterwards reported to be singing "California Here I Come". At around 11.50 p.m., the speeding Consul blew a tire whilst travelling through Chippenham on the A4, lost control, and crashed into a lamp post whilst travelling around a corner at Rowden Hill, where a plaque now marks the spot - no other car was involved in the accident. Eddie Cochran, who was seated in the centre of the back seat, threw himself over his fiancee', Sharon Sheeley to shield her, but was thrown out of the car when the door flew open. Patrick Tompkins was also thrown out of the car. All of the occupants of the car were initially taken to Chippenham Hospital and later transfered to St. Martin's Hospital, Bath with the exception of George Martin who escaped the accident unhurt. 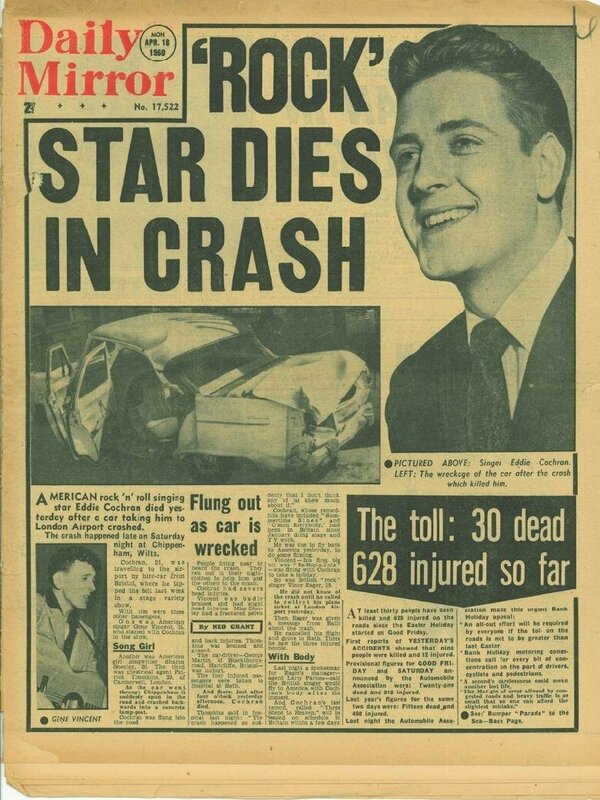 Eddie Cochran sadly did not survive the accident and died of severe head injuries the following day at 4.10 pm. Eddie Cochran's body was flown home and his remains were buried on April 25th, 1960 at Forest Lawn Memorial Park in Cypress, California. Sharon Sheeley and Gene Vincent survived the crash along with George Martin. Gene Vincent broke his collarbone, a few ribs and suffered a leg injury sustaining lasting injuries to an already permanently damaged leg that would shorten his career and affect him for the rest of his life. Sharon Sheeley broke her pelvis. The taxi driver, George Martin, was convicted of dangerous driving, fined £50, to be paid off at £5 a year, disqualified from driving for 15 years, and sentenced to prison for six months (although by some accounts he served no prison sentence). His driving licence was reinstated in 1969. The car and other items from the crash were impounded at the local police station until a coroner's inquest could be held. The Ford Consul MkII has a 4-cylinder Zephyr engine in it. The driver, George Martin, must have been driving really fast for the road conditions (ie. around 60mph plus on a sharp corner): the Zephyr is an excellent handler (even on the bias-ply tires), is as solid as a tank, and yet the car was still completely destroyed! Interestingley, David Harman, a police cadet at the station who would later become known as Dave Dee of the band Dave Dee, Dozy, Beaky, Mick & Tich, taught himself to play guitar on Cochran's impounded Gretsch. Earlier in the tour, the same guitar had been carried to the car for Cochran by a young fan, Mark Feld, who would later be known as Marc Bolan of T. Rex and would also die in a car crash. A memorial stone to commemorate Eddie Cochran can be found in the grounds of St Martin's Hospital in Bath. The stone was restored in 2010 (on the 50th anniversary of his death) and can be found in the old chapel grounds at the Hospital. A memorial plaque can also be found next to the sundial at the back of the old chapel. Monday's Daily Mirror led with the story, "Rock Star Dies in Crash", but such was the antipathy towards youth culture that the accident was not even highlighted in The Times. Gene Vincent had been in a serious road accident, lost a close friend and damaged his ribs. He returned to America but Larry Parnes brought him back within a fortnight for the second leg, now billed as a tribute to Eddie Cochran. One booking was at Liverpool Stadium on May 3rd. To replace Eddie Cochran, the bill was completed with local acts including Gerry and the Pacemakers but not the Beatles as the promoter Allan Williams did not consider them good enough. A few weeks later, Larry Parnes came to Liverpool, heard them and booked them to back Johnny Gentle on a tour of Scotland. British rock'n'roll was finding its own identity. Larry Parnes's tour with Gene Vincent collapsed at the Theatre Royal, Nottingham, after the singer read out a telegram which said his daughter, Melody, had been killed. The audience laughed as they thought Vincent in his mumbled, incoherent way was talking about a dog. Vincent flew home to find his daughter was safe, which was always the case as he had sent the telegram to himself. Gene Vincent staggered on with increasingly chaotic gigs and his wild personal life. 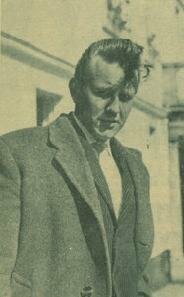 He died in October 1971 of a perforated ulcer: he was a destitute, confused, overweight, alcoholic and humiliated wreck. He was buried in black leather in Newhall, California. After 15 nomadic years, Gene Vincent was staying put. Eddie Cochran's fiancee' Sharon Sheeley, was a rather successful songwriter in her own right. She had penned "Poor Little Fool" that was a number one hit for Ricky Nelson in 1958 and co-wrote with Jackie DeShannon after returning to the US after recovering from Cochran's fatal crash. She died on 17th May 2002 of a cerebral hemorrhage suffered a few days before.